A classic of the horror genre, Dennis Wheatley’s The Devil Rides Out pits the powers of good against the forces of evil as the Duc de Richelieu wrestles for the soul of his friend with the charming but deadly Satanist, Mocata. Mocata has the power to summon the forces of darkness and - as the Duc and his friends will find - is willing to call upon ever-increasing horror until thundering hooves herald the arrival of the Devil Himself. The book was also made into a classic cult horror film in 1968, starring Christopher Lee and Charles Gray. First read the book in the late '60s as a young teenager. It provided plenty of enjoyment then. Like all books I like I'll read them over and over but I admit to not having read any Wheatley yarn in over 35 years. This was a thoroughly enjoyable return to this novel. The story is well paced and constructed. And while as an adult I'm a lot more sceptical on many things I once firmly believed in as a 16 year old the novel is no less captivating. Would you listen to The Devil Rides Out again? Why? Yes. I enjoy the atmosphere of the book and the slow build of suspense. In fact, I've listened to it several times. The first time I heard it was years ago as a public library check out. I was happy to find it at audible. Have you listened to any of Nick Mercer’s other performances before? How does this one compare? If you could rename The Devil Rides Out, what would you call it? A very enjoyable listen to a book I had trouble slogging through on paper. This book is the basis of the wonderful Hammer film of the same name. A bit uneven at times, but a fun and enjoyable romp through the terrifying world of Wheatley's imagined Satanic cult conspiracy. I had long been aware of Dennis Wheatley's occult novels, but only recently decided to give one of them a try (I'd first read of them in an interview with Black Sabbath's bass player, Geezer Butler, on whom they exerted a big influence). 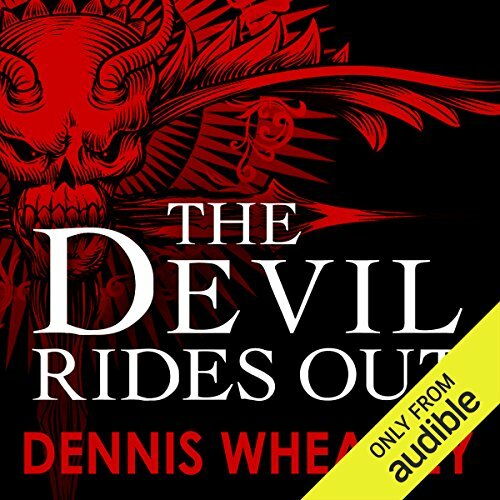 For some reason I was under the impression that _The Devil Rides Out_ is a novel in the "occult horror" genre and that Wheatley is a horror writer, but I realized that I was mistaken by the time I was about a third of the way into the story. _The Devil Rides Out_ is not a horror novel, as I had expected. However, I wasn't at all disappointed. This is a solid, first-rate thriller that I found immensely enjoyable. Wheatley in the end is probably more Ian Fleming than Stephen King (although his prose style is a bit more lush than either of those writers), and I would be willing to bet that he influenced many authors in the first wave of modern thriller writing (Frederick Forsyth, Ken Follett, etc.). The narrative is structured thus: A young man comes under the influence of a cult leader who gives off the appearance of a Crowleyesque charlatan and pretender but who nevertheless possesses considerable charisma and personal magnetism. He is clearly evil, but those who fall under his sway are unable to see it. The first part of the novel revolves around the attempt of this young man's friends to intervene on his behalf and get him out from under the influence of this black magician; to rescue him from the clutches of the cult. I won't say whether or not the attempt is successful, because I want this review to remain spoiler-free. But the second half of the novel is a wildly suspenseful race-against-time wherein the protagonists (good guys) attempt to thwart the above-mentioned "magician" from conducting a bloody human sacrifice to Satan. Again, keeping it spoiler-free, so I won't say anything more about the outcome. Suffice it say that Wheatley had very good commercial instincts and he really knew how to turn out a pulse-pounding, ripping good story. I you like a good thriller and don't mind the exotic element of Satanism (which Wheatley definitely does NOT put in a positive light) thrown in, then you will probably enjoy this story. It is almost unbelievable that such a wild story about Satanism and human sacrifice would be published in the 1930s, and garner such a wide and enthusiastic readership! Nick Mercer's voice is a perfect fit for this novel. No complaints on that score. Would you try another book written by Dennis Wheatley or narrated by Nick Mercer? Yes to Wheatley. No to Mercer. Would you be willing to try another one of Nick Mercer’s performances? Disappointment. A great story spoiled by its reading. If you could sum up The Devil Rides Out in three words, what would they be? What was one of the most memorable moments of The Devil Rides Out? The night time in the library when the evil forces try to take Simon. What about Nick Mercer’s performance did you like? Brilliant reader. The characters were clearly defined by his reading and amazingly consistent. I was fascinated by the period drama aspect of the story, the aspects of occult and the pace and clarity of the writing. I usually prefer modern crime or Agatha Christie but fancied something a little different. This was superbly written and so well read as to be a tour de force. Some aspects are a little too far fetched but that in part is the joy of the occult. Excellent performance of a classic Dennis Wheatley story. Well told and accurate to the book. Unlike the Hammer movie. This is a classic book written in 1934 and is a occult adventure story of good versus evil - times and attitudes change and unfortunately the words within this audio version vary from the original book, in my view as a purist, it should stay true to the original form and be accepted as such by the listener with the words used, as written by the author at that time. Initially I found the building up of the story a little ordinary, not bad but somewhat formulaic. At the same time I didn't initially feel sufficiently invested in the character who was in jeopardy to really feel the tension. However, once I got about a third of the way in there are some brilliant set pieces and the characters had grown on me enough that I cared about their plight. I had to listen to the last 2 hours or so in a solid block, so it had really picked up by the end. The conclusion was perhaps a little unsatisfactory, but I honestly can't think of a better way to do it, so I don't really think I can heavily criticise it for that. The narration was a bit patchy at times, Nick Mercer sometimes seemed to be confused about which character was speaking and on at least one occasion read one of the characters names wrongly! Pretty solid overall though. This 1930`s horror story still has the power to chill. Dennis Wheatley is an excellent storyteller and despite careful explanations of occult practices, well researched by the author, one`s attention is always engaged and the adventure enjoyed. I first read this book in the late 40`s. It was a good read then and is a good listen now. Listened to this book several times and always pick out some new information. Recommend it to all. Cracking story told brilliantly by Nick Mercer loved the film and the book never slows in pace. I can easily recommend it’s purchase. Exciting, fast story. Well read with a subtle delivery that adds more impact than the more overdramatic alternatives. I recommend all the Mercer readings of the Wheatley books. Would you consider the audio edition of The Devil Rides Out to be better than the print version? A great story, great performance. Loved it. Which character – as performed by Nick Mercer – was your favourite?